The Granite Gurus: FAQ Friday: What Granite & Tile Coordinates with Red Dragon Granite? FAQ Friday: What Granite & Tile Coordinates with Red Dragon Granite? "We are doing a rustic Arizona Ranch home with a two island kitchen, one more or less a bar separating the great room. I want to use a leathered brown terra cotta or rustic stone floor. One island in distressed black finish with red dragon on top. What other granite for the other wall counters and island would coordinate. We also want rustic medium brown cabinets. Also, then, what type of backslash design." Thanks for the email Susan. 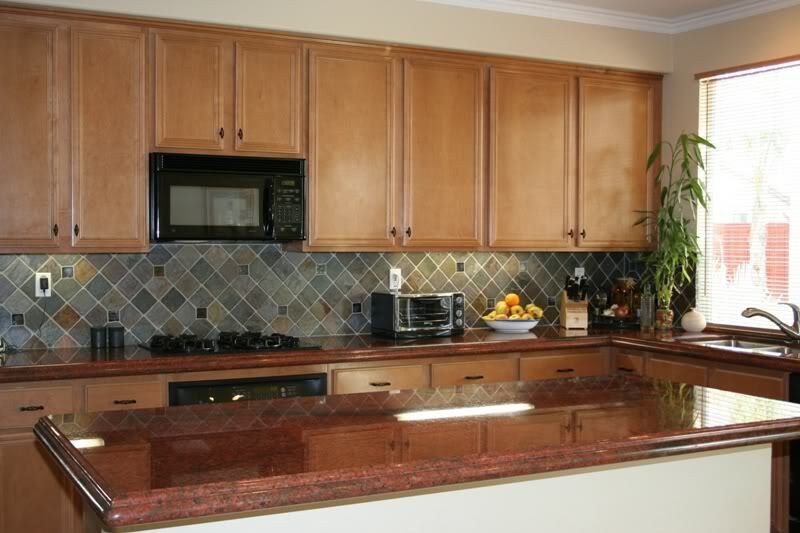 Red Dragon is a beautiful granite and you'll definitely want to keep it the focal point of the kitchen. So I'd go simpler on the other two countertops. My first suggestion would be Cambrian Black with a Satin Finish. It's a beautiful granite that won't compete with the Red Dragon, but will give you a more unique look and work well with your rustic home. I'd also suggest Absolute Black with a polished or even a honed finish. Virginia Mist granite would look really pretty with the Red Dragon because it has some greys in it. You could also go with a dark grey quartz like Concrete or Raven from CaesarStone, but they may not be as rustic as you are looking for. For your backsplash you have a lot of options. Durango Travertine would be really pretty. You could get it in the tumbled tile which would make it more rustic. There are a lot of glass tiles out there that you could match the red of the Red Dragon granite to that would pull the reds together. If you could find a slate that worked with your floor and had some reds in it that would look great as well. 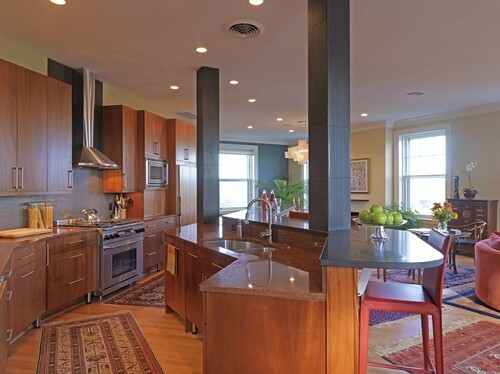 In the kitchen below (two photos), they used what looks to be Absolute Black granite on the upper bar of the island. It works really well with the Red Dragon on the lower bar and the perimeter countertops. The backsplash is a linear dark grey porcelain tile. 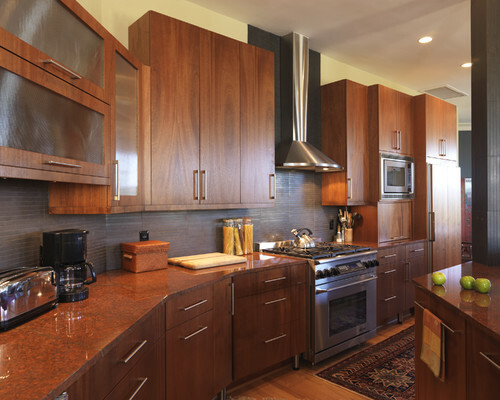 eclectic kitchen design by dc metro kitchen and bath Case Design/Remodeling, Inc.
Hopefully this helps Susan! Good luck with your project. If you have a stone or design question you'd like to see answered here on FAQ Friday send me an email.